However, most people can’t describe precisely what it is or how it works. Let alone discuss its limitations. In the 1800’s a young Charles Darwin accompanied a British naval ship called the H.M.S. Beagle which was on an exploratory mission. Among his many observations he saw that on the islands of the Galapagos (offshore from Peru) there were several variations of finches. Darwin had studied and collected finches from the South American mainland and now did the same with the Galapagos finches. Later he would remark on how the Galapagos finches had unique beaks and other body features when compared to the average mainland finch. Darwin noted that due to the different environmental conditions and food chains on the islands compared to the mainland, certain characteristics were better than others for allowing finches to survive. For example, in environments where droughts were common, finches with powerful, thick and stubby beaks could better scavenge the tough older, dryer seeds because of their stronger beaks. As a result each season more tough-beaked finches would survive than other finches and so made up more of the next generation of finches. The different environments had a direct impact on which finches were better suited to survive and so “naturally selected” certain finches. Darwinian proponents believe that this type of phenomenon — which no one denies occurs — explains not only the different types of finch beaks on the west coast of South America, but the very way in which bacteria were first formed and slowly changed into elephants. Often, in support of the belief that natural selection is an all powerful creator, it is pointed out that dog breeders engage in the same selective game that Nature does. In what is called “artificial selection” breeders take Nature’s role and choose which dogs to breed together and keep these descendants separate for several generations to further “mold” the type of dog characteristics they desire to preserve. Due to the fast acting interference of people compared to the slow changes in climates and ecosystems, we can greatly speed up the process of change when performing artificial selection on a species. As a result, in a few centuries we have gone from the majestic wolf and “created” the chihuahua. Is this not proof of the limitless power of natural selection to make any type of life imaginable? Do we need to even question the Darwinian paradigm at this point? The answer is yes, we need clarity and criticism at this point. In the above examples we see that all species have a natural variety of characteristics. Not all finches, wolves, bacteria or flowers are identical. Neither are people. Some of us are short, others tall. Some have blonde hair and blue eyes. Others are naturally muscular others are more slender. All of these traits in the biological world are the result of genes in the genetic code (i..e.: their genome). If a unique environment allows certain features to be better for survival, the members of a species that possess those traits will have a higher probability of survival and will eventually come to dominate the population. Some features may even go extinct. This is all that the term natural selection means. Nature selects which members of a species have a better chance at survival. In order for biological life to evolve from bacteria to the brontosaurus, the genome itself must change over time. Nature may constantly select certain genes, but who creates new ones for her to select? The answer from the Darwinian camp is: mutations. Let us zoom in on human beings in order to explore the notion of mutations in evolution. Our DNA determines our physical characteristics. DNA is the information blueprint that tells our cells how to build proteins and ultimately how to build our bodies. DNA is made up of four different nucleotide bases. 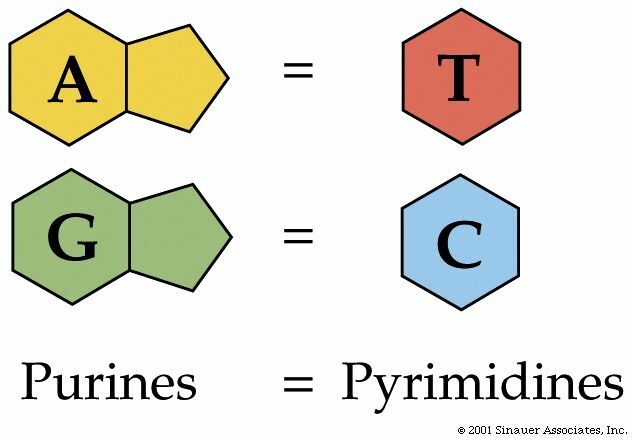 Adenine, thymine, guanine and cytosine. Or A, T, G, C for short. A can only bond with T and G can only bond with C. When bonded, their combination is labelled a “base pair.” This interlocking genetic language is the information code for our bodies in the same way that 1’s and 0’s are the letters that make all computer software tick. Obviously, in order to change a person’s body plan you would need to change their DNA. Just like you would need to write reams and reams of new software programming to change or create a video game. Except the intricacies of biology are immeasurably more fragile and complex and numerous than those of our computer software. So changing DNA is a precarious and highly complicated venture. A mutation is simply an accidental change in one or more of the letters of DNA (A, T, C or G). Clearly, if one of my trillions of existing cells makes a genetic mistake, my body won’t change or even recognize it. But if every cell in my body contains the mistake, my body will reflect it. In order to make sure every cell in your body carries a mutation, the mistake must be made before or at conception. When your father’s sperm fertilizes your mother’s ovum, you are now a single cell. Your body then puts this cell in its photocopier and presses “copy x 37 trillion.” And voila! Your body is being built on the information of that first cell. So a mistake made in the creation of sperm or ovum or very early in the fertilized egg’s life will be passed on to the rest of your developing body. “Once you have added part 34c, make a quarter turn then add _________________________”). Or think of a fork with a handle but no forked ends, or a crucial bit of computer programming that is incomplete and therefore unreadable by your hardware. As time goes on — say proponents of Darwinian evolution — these types of changes accumulate and give us entirely new genes and gene sequences. Hence we have found our source of innovation to account for the reams and reams of new genetic paragraphs, pages and chapters that are needed to make a whale out of a worm. Unfortunately for proponents of unguided evolution, nature does not suffer mutations gladly. As a very firm rule, mutations hamper or even destroy organisms. If your genetic code contains an error in one or more of its genes, you will have some form of disorder, disease or death. Mutations of this gene will affect the amount of von Willebrand factor which is an essential part of blood clotting. This mutation causes what we commonly call “hemophilia.” A condition in which blood clotting is slowed and causes dangerously prolonged bleeding from even minor injuries. Interestingly, blood clotting occurs in a 10 step chemical reaction series. So von Willebrand factor is only a small part of the precisely tuned blood clotting mechanism. Yet even a small alteration in one part of our clotting process can be deadly. Other genetic disorders caused by mutations include things such as Down’s Syndrome, Dwarfism, cystic fibrosis, high blood pressure, diabetes, etc. (a larger list can be seen here). As you can see, mutations are not desirable. Try popping the hood of your car and bending, melting, shortening or removing any of the parts of your car’s inner workings. Do you think it will run better? And how does this destructive process help build new and better car parts? It is not innovation it is selective destruction. Our bodies are very precisely tuned machines and do not take kindly to being tinkered with. To pin your hopes of creation on random mutations is foolish when faced with the actual reality of our bodies and biology. We are not haplessly glued together. We are not a simply painting on a canvas that can take on multiple forms before being converted into a different painting altogether. New species require instant “downloads” of completely integrated genetic instructions to fully implement organs, organ systems, blood and body chemistry and multiple other innovation that cannot exist in part but most appear holistically and fully calibrated. The 3 intermediate steps between the first and last sentence are meaningless. As humans looking at this completed sequence we can tolerate the intermediate stages because we see the big picture. But genetics does not work with meaningless statements. A meaningless or erroneous protein can mean the difference between life and death or at least disease. Further, to significantly change a protein from one type to another would require far more steps than the example above. This would usher in countless meaningless steps which would not survive the process. Also, to change a single protein is almost meaningless itself in the face of the types of changes required to form a new species. Think of the two chambered heart of fish compared to the 4 chambered heart of mammals. The fish body plan also includes a huge litany of chemical differences that allows the mixing of oxygenated and de-oxygenated blood of its unique circulatory system. Counting how many genetic programming innovations have to occur to account for the transformation of fish anatomy to even the most rudimentary mammalian body plan only in regards to the circulatory system is staggering. We are talking about millions of changes to the genome. Not just a four letter change. Not only do we not see such transitions in the fossil record (even though some examples have been proposed) we cannot account for a viable mechanism that would create the finely tuned, interdependent chemical, hormonal and tissue changes in small or even large steps. Each step being built fully by accident and meandering its way to another fully adapted organism. Some Darwinian proponents will point to the fact that some genetic changes do not show up in the body plan. That is, they are silent and therefore cause no harm. The term for this type of mutation is a genotypic mutation. Which simply means it is in the genome but is not physically manifested in the body at all. A phenotypic mutation on the other hand does show up in the body somewhere and somehow. By showing up, a mutation gives nature a chance to select it or not. But as we have seen, mutations cause disorder and death and are a poor choice for the role of error-free software programmer. As a result some Darwinian adherents rely on a quiet revolution occurring invisibly in the genotype and eventually bursting onto the phenotype when everything is primed and ready. Sort of like a movie studio making a movie but not releasing it until all is complete. There are serious problems with this view. First, to think that major genetic changes are being prepared craftily behind the scenes in ways that are not harmful and only revealed when fully ready sounds exactly like the work of an Intelligent Designer. To say that completely blind random errors are slowly preparing a complex architectural, chemical and mechanical revolution is non-sensical. If rain fell in such a way as to spell out two full pages of Shakespeare on the pavement in front of my house I would be gravely mistaken to attribute it to random chance. Second, by being invisible the mutations cannot be naturally selected by nature and therefore there is no guarantee that the creature harboring the behind-the-scenes changes will be around in a generation or two. Nature has to have something to hold on to in order to promote the survival of a genetic variation and — like dog breeders — preserve a certain ancestry branch and help it securely move into the future for further adaptation. To rely on pure chance to preserve just the right single family of a species as a behind-the-scenes innovation revolution is “accidentally” being finely tuned and prepared adds another layer of mathematical impossibility that further dooms the genotypic mutation theory of Darwinian evolution. Thirdly the amount of time realistically needed for these types of mutation-led changes is far too long for the time frame offered to us by the fossil record. About 540 million years ago our ecosystem experienced what is labelled the Cambrian Explosion. It is aptly named because within 54 million years we went from essentially single celled organisms and jellyfish to most of the phyla in the Animal Kingdom. This rapid appearance of highly complex life has been a mystery to evolutionists for decades. Some biologists such as Stephen J. Gould proposed mechanism by which evolution would have to have worked in jumps. Clearly, the time line is of concern for even staunch evolutionists. Mutations being the cause of new genetic information obviously suffers some significant problems. We simply do not observe this and even the theory of such a mechanism is wrought with difficulties (if not fatalities). A reporter once asked eminent evolutionary biologist Richard Dawkins to site an example of mutations bringing in new genetic information. As the following video will show, he was soundly stumped. Even when he regrouped he was not able to answer the question and simply launched into a retelling of the general theory of evolution. This should be unsettling to Darwinian proponents seeking for actual explanations backing up their worldview. In order to see how much diversity you can get from a genome, the more generations of a species you can breed in a short time the better. It would be like seeing how many sides a dice has by rolling it. The more you rolled it the quicker you could determine how many sides it had. If after 10,000 rolls you remark that you’ve only ever rolled the numbers 1 through 6 and never even once rolled a 7 or higher, you could safely determine you had a 6 sided dice. For the purposes of determining the limits of evolutionary change in an existing set of DNA single celled organisms like bacteria are ideal. For example the Staphylococcus Aureus bacteria replicates about every 30 minutes. So in half an hour you will have two bacteria. Thirty minutes later, you will have 4. Within 12 hours you would have a staph. aureus colony more than 30 million strong. Therefore, when it comes to the interaction of bacteria, viruses and parasites with the human race over the past tens of thousands of years, the number of generations of these single celled organisms that have been replicated will quite literally be innumerable. Therefore the limits of evolutionary change can be well established by looking at this microbial world. No other life form on earth has had as many generations as these. The parasite known as plasmodium falciparum is responsible for causing the most common form of malaria in humans. Like a bacteria, this single celled organism has undergone countless trillions of replication over the past several thousand years. And for a very long while it has run rough shod through humanity. It is estimated that malaria is responsible for well over a million deaths every single year. Mosquitoes that host plasmodium parasites pass them on to the humans they bite. Once inside its human host, the malaria parasite holds up in the liver and multiplies. It then hits the general circulation and infects individual red blood cells. Feeding on the hemoglobin protein inside these cells the parasite grows and copies itself about 20 times. Finally the poor red blood cell bursts and unleashes nearly 2 dozen new malaria parasite and the cycle continues. Within days the human host will have trillions of these blood eating parasites in their body. It won’t take long before too many red blood cells are destroyed and the human host dies. So why is malaria an important step in the evaluation of Darwinian evolution’s plausibility? Well it turns out that the only solid immunity we have ever developed against this unstoppable killer that is malaria has been due to a missense mutation at the sixth amino acid location on the second amino acid chain of the protein hemoglobin. A single mutation had caused an immunity to a deadly plague! Surely this is proof of the constructive power of evolution by random mutation is it not? The single amino acid change caused the hemoglobin inside the red blood cell to collapse onto itself when the malaria parasite invaded it and began maturing and replicating inside. Such a collapse caused the red blood cell to take on a sickle shape. When this sickle shaped red blood cell passed through the spleen, it was immediately recognized and destroyed by the immune system, killing the malaria parasite at the same time. Hence the scourge of sickle cell disease became a savior to many African children (the mutation first occurred on the African continent). As a result, descendants of the first sickle cell carrier began to become more and more numerous with each generation. Unfortunately, this led to the first “full sickle cell” child in which both of his or her parents had the sickle cell mutation. Unfortunately, by inheriting two sets of the mutation, the hemoglobin inside the red blood cells don’t need to be invaded in order to fold up onto themselves and warp the red blood cell. Far too much of the blood is involved and death is a matter of time. But having only the one half sickle cell inheritence will give you a resilience (not cure) to malaria. Yet even half of the sickle cell inheritance will leaves its human carrier battered. Even without malaria infection into the red blood cells the “half” sickle cell carrier will still see many of their blood cells warped by folding hemoglobin. This puts undo strain on their bony development, spleen health and ability to oxygenate tissues. It is still a disease even if it is a barrier for the spread of malaria. Microbiologist Dr. Michael Behe (author of “Darwin’s Black Box” and “The Edge of Evolution“) calls the trade off between sickle cell and malaria “trench warfare, where conditions deteriorate.” As he points out, Darwinian proponents expected mutation to be a sort of “productive arms-race cycle of improvements on each side” yet it turns out nothing is being built and everything is being destroyed. Remember that for about 5 thousand years the human race has had the mutation causing sickle cell. One single amino acid change and millions of quadrillions of generations of malaria parasites have been unable to overcome this barrier. It does not bode well for evolution if a single mutation can stop a formidable foe in its tracks. And notice that no new genetic information has been produced by the process so the notion of looking for mutation to create new, innovative genetic programming is still bankrupt. All that has occurred is that a destructive disease has placed a barrier to a parasite. As an open minded skeptic of Darwinian evolution I want this type of discussion to be entertained at all levels of academia. If there is a solution to the apparent mathematical impossibility of evolution by random mutation it will become known eventually. If the inability of blind natural mechanisms to account for the pristine machinery of life and its information blueprint continues to become more evident, then so be it. Unfortunately, even with all of the discoveries over the past few decades showing the information-rich and nano-machinery riddled anatomy of the cell, it is still illegal to even describe the critiques of Darwinism in almost all school districts in the western world. Hopefully, if more people become aware of the issue and its intricacies, this may one day change.